Slide into the Chandler leather platform wedge sandal by White Mountain shoes to experience a true match made in sandal heaven. 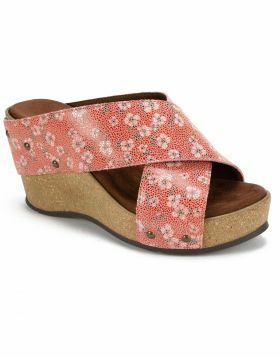 The soft suedette cushioned and contoured footbed sits on top of a light cork wedge with a durable rubber outsole. With the same double strap and adjustable buckle design as the best selling Helga sandal, the Chandler wedge slide is an absolute must buy. Slide into the Chandler leather platform wedge sandal by White Mountain shoes to experience a true match made in sandal heaven. 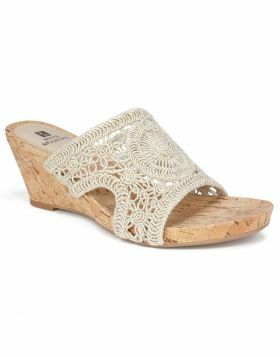 The soft suedette cushioned and contoured footbed sits on top of a light cork wedge with a durable rubber outsole. 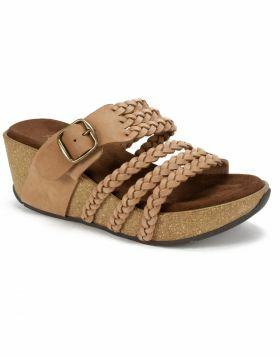 With the same double strap and adjustable buckle design as the best selling Helga sandal, the Chandler wedge slide is an absolute must buy. Heel height: 2 1/2 inches.